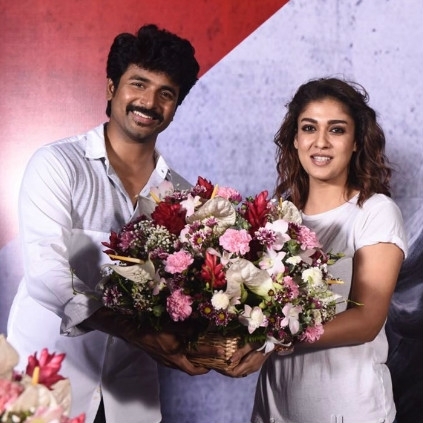 NAYANTHARA JOINS SIVAKARTHIKEYAN AGAIN AFTER A BREAK! Nayanthara is a busy actress, who is managing quite a few interesting projects at the same time. The Maya actress was busy all the while shooting in London for the Chakri Toleti directorial, Kolaiyuthir Kaalam. Now, the latest we hear from close sources is that she is back in Chennai to resume her shooting for Sivakarthikeyan - Mohan Raja's film Velaikkaran. It is said that she has started to shoot from yesterday (10th April), and some important scenes in the film are expected to be canned in this schedule. Velaikkaran, starring Sivakarthikeyan, Nayanthara, Fahadh Faasil, Sneha, Prakash Raj and others, has music by Anirudh and is being planned to release on 25th of August. Dhanush makes a breaking statement on Vada Chennai! Kavan film honoured: Suriya congratulates! Inspiration from Vijay’s Nanban in real life? People looking for online information on Nayanthara, Sivakarthikeyan, Velaikkaran will find this news story useful.